The University of Maryland (UMD) and Techno-Sciences Inc. (TSi) were awarded a utility patent on November 23, 2010 by the United States Patent and Trademark Office, entitled “Fluid-Driven Artificial Muscles as Mechanisms for Controlled Actuation,” as U.S. Patent Number 7,837,144 with inventors Dr. Curt Kothera, Benjamin K.S. Woods (G), Dr. Jayant Sirohi (Ph.D.’03), Prof. Norman M. Wereley, and Dr. Peter Chen (Ph.D.'96). Drs. Sirohi and Chen are Ph.D. graduates of the Dept. of Aerospace Engineering, while Mr. Woods is currently a Ph.D. candidate. The abstract for the patent, comprising 16 claims is as follows. "A fluid contact surface actuation system for a vehicle, including a first fluid contact surface constructed and arranged to act against a first fluid passing over the first fluid contact surface; and a first fluid actuator coupled to the first fluid contact surface to move the first fluid contact surface between a first position and a second position to enable control of the vehicle in a predetermined manner, the first fluid actuator having a first resilient bladder that receives a second fluid such that pressure of the second fluid moves the first bladder between a contracted configuration and an expanded configuration." 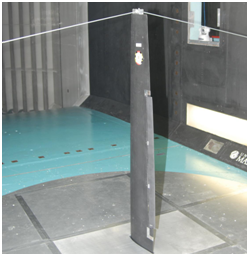 This patent was reduced to practice by developing and fabricating trailing edge flap actuation systems based on pneumatic artificial muscles for a UH-60 helicopter blade section (figure 1), and a Bell 407 blade section (figure 2) in the Smart Structures Laboratory, and then tested in the Glenn L. Martin Wind Tunnel, both at the University of Maryland. These systems were developed by a team of Dr. Wereley’s graduate students, in collaboration with engineers at Techno-Sciences Inc. (Beltsville MD). This patent is another in a joint portfolio of intellectual property for myriad of shock, vibration and motion control products developed by Techno-Sciences Inc.’s Aerospace Division and the University of Maryland's Smart Structures Laboratory.